One of the biggest advantages of kraft sack for construction sector is that it allows for mass work in the site. Same time, it provides easy stacking and storage due to its nonslipping stacking feature. 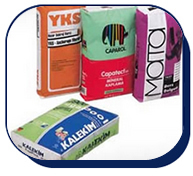 Especially, with reinforced paper handle on 15 kg sacks, it ensures easy to carry facility for consumers in construction markets; vivid, multi color and illustrative printing is available for most effective reach to the consumer. and for similar products, 10 kg, 20 kg, 25 kg, 30 kg, 40 kg, 50 kg valve hexagonal bottom and open mouth sacks are recommended.